The tiny house movement is partly a response to the Great Recession, as people looked for smaller, more affordable forms of housing. 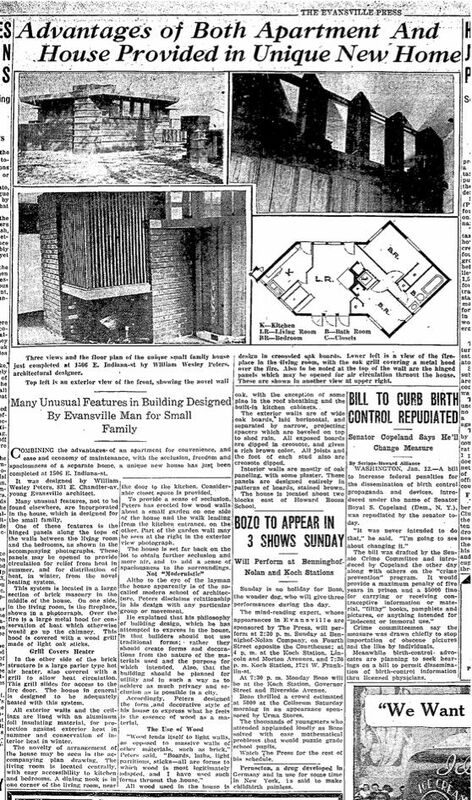 Back in the Great Depression, Frank Lloyd Wright came up with the Usonian House as a response- smaller and more affordable houses that he thought would be snapped up by the middle class. This eccentric cottage and proto-tiny house offers perhaps the earliest example of Usonian-style architecture, a vision of residential construction and planning for the common man that was a passion of Frank Lloyd Wright. Interestingly, Peters was only in private practice for a few years; according to Sisson, Wright did not approve of Peters relationship with his daughter Svetlana. He later relented to it and Peters came back to become Wright’s right hand man, working on Fallingwater and finishing the Guggenheim. What blows me away is that Peters was 22 when he did this. It’s a bold step to take, to invest in yourself. He’d just got his architectural license, and just walked away from this great position. This is a bold decision for a young man just starting his career to make. Combining the advantages of an apartment for convenience, and ease and economy of maintenance, with the seclusion, freedom and spaciousness of a separate home. Although to the eye of the layman the house apparently is of the so-called modern school of architecture, Peters disclaims relationship in his design with any particular group or movement. He explained that his philosophy of building design, which he has attempted to express in the house, is that builders should not use traditional forms; rather they should create former and decorations from the nature of the materials used and the purpose for which intended. Also, the building should be planned for utility and in such a way as to achieve as much privacy and seclusion as is possible in the city. This is really, in our view, the most pure of all Usonian homes. It was very pure to the concept, to provide housing for a huge part of the population that deserves a quality lifestyle but didn’t have much money. It’s such a miracle that it survived. And with two bedrooms, a bath and a comfy living space in just 552 square feet, it’s a good model for compact modern living. It's another example of how old buildings are not just relics from the past, but can be templates for the future. More information is available on Facebook at the Peters-Margedant House Preservation Project, where they are only $40K away from their fundraising target.